On Saturday, June 11, 2016, over 100 people gathered for the annual MWHIT breakfast, held during the Mormon History Association conference. Our speaker was President Alice Faulkner Burch, president of the Relief Society in the Genesis Group (a support group for African American Latter-day Saints), who spoke about "Black Women in the LDS Church and the Role of the Genesis Group." Sister Burch shared her own story, as well as the history of the Genesis Group and the work of the Relief Society within the group. It was a powerful, memorable event, sure to rank as one of the highlights of this year's conference. Many people have requested a copy of the text of President Burch's remarks. She has graciously permitted us to publish it here. We have made only minor edits for format and style. Thank you for inviting me to speak to you today. I am very appreciative. I believe that the spirits of those deceased are allowed to be present on special occasions. I think what’s defined as a “special occasion” may be different for parents, so my parents Cleo & Elwanda Faulkner may be present today observing their baby girl speak to such a prestigious group. My talk is titled Black Women in the L.D.S. Church & The Role of the Genesis Group. 8 My name is Jehovah, and I know the end from the beginning; therefore my hand shall be over thee. Ruffin Bridgeforth, Darius Gray, and Eugene Orr wanted a place for all black LDS members to gather in Utah for support. They worked with Elder Gordon B. Hinckley, Elder Boyd K. Packer, and Elder Thomas S. Monson to form The Genesis Group. It was established as a dependent branch to serve the needs of and support African American members of the church. On 19 October 1971 Ruffin Bridgeforth was set apart as President with Darius Gray and Eugene Orr as his counselors and Mary Lucile Perkins Bankhead as its first Relief Society President. Its goals were to do missionary work and facilitate reactivation among the black members in the Salt Lake area. Even without the priesthood, these leaders had a strong impact upon the members of Genesis and have had a lasting influence upon the black community in Utah. Can you imagine: a black man LEADING an LDS Church organization? A black Relief Society President during a time when that was not only unheard-of but projected as never being possible? With the priesthood restriction to black men in place, black women were impacted as well. Without priesthood blessings they could not attend the temple to be endowed or to be baptized for their deceased family. Although they could go to a white male priesthood holder for blessings of health, the priesthood didn’t reside in their homes. In these three ways – no endowment, no temple work for family, and unable to go to their father or husband for a blessing – black women were denied the blessings of Abraham. There were many other ways as well. 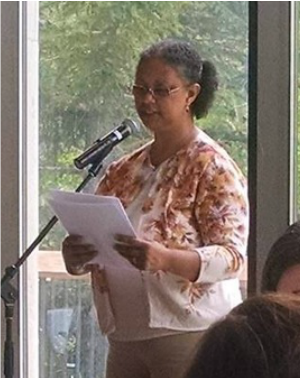 One particular woman in church history – Jane Elizabeth Manning James, whom you met via proxy by Jerri Harwell yesterday – stands as an example of the hardship and sadness caused by the priesthood ban in the lives of black women. With immense hunger to enter the Salt Lake Temple which she saw constructed, Jane wrote at least five letters begging the presidents of the church for her temple blessings. Jane’s question of “… is there no blessing for me?” shakes as an implicit appeal to God to keep His promise to Abraham and a plea to God’s prophets to bring it into her life. She proposed various options – including being sealed as a child to Joseph & Emma Smith per an offer they had made, being sealed to Elder Q. Walker Lewis (a black member), and doing the baptisms for her deceased family. Repeatedly she was denied – wholly based not on her personal worthiness but on the color of her skin . . . only because she was NOT white. Unfortunately, neither righteousness, taking the name of Jesus upon her by baptism, nor her great faith in the Lord qualified Jane to enter the holy temple for herself. An eternal servant. A slave. A relationship that in the eternal law of God doesn’t exist and that is even today a spit in the face to all black women. In 1979, a year after the priesthood restriction was lifted and 71 years after her death, Jane Elizabeth Manning James was anointed and endowed by proxy. Jane finally achieved her heart’s long-sought-after greatest desire. Jane’s faith kept her anchored to a belief that God is just, even if social conditions are not. It is this same belief and deep-seated faith in many black women that enabled us to join the church before the priesthood restriction was removed, to join in the face of overt racist ostracism in our own wards, to join regardless of the lack of support, and to remain although many of us are laughed at for our hair or the sound of our voice or are told even today that we are cursed. -a painting of a young black woman with her hair in micro braids hangs in the sealing waiting room of the Payson UT Temple, near the women’s dressing room in the updated Ogden UT Temple, at the entrance of the Seattle WA Temple, and in several other temples. This picture also hangs in the Salt Lake Temple, the temple that Jane saw to the day she went blind, the temple she desired to enter but was never permitted. Personally, this painting hanging in THIS specific temple is wonderful, but I wish someone had had the sentimentality to make it a painting of Jane. A beautiful gesture to a woman who endured much from the community she loved and never left. -Greg Olsen’s painting “Hand in Hand” which depicts Christ holding the hand of a little black girl, is beginning to pop up in ward buildings across the U.S. This is most significant because the pictures for our meetinghouses are personally chosen by the stake president. -Two black women (Zandra Vranes and Tamu Smith known as The Sistas in Zion) hosted the concert at the BYU Women’s Conference in April this year. -Tamu & Zandra are currently part of the Time Out for Women tour sponsored by Deseret Book. -The church has sent the Genesis Choir, newly named One Voice International, into the world to do missionary work via gospel music. This choir is thick with black women and is led by a black woman, Debra Bonner. One of its most significant recent performances was at BYU’s Women’s Conference. They will appear at The Stadium of Fire, a highly significant Utah venue. With a little support or with no support, black women of the church are proving that we can do great things for the church. Moving forward into recognition under the direction of Elder David T. Warner of the 5th Quorum of the Seventy, the Genesis Group is beginning to become known as an official auxiliary of the church. Its main purpose today is to host firesides and activities to support and edify all L.D.S. members, their friends, and families, and to assist individuals interested in the church. We assist mission presidents, stake presidents, and bishops. It also provides a place for black members to gather, to experience our culture, to receive uplift and solace from a world and wards that often shun us, and to have leaders who look like us and can provide positive strong examples of good black women and men for our children to become. Natalie Palmer-Sheppard, Muriel Lee, Gloria Wilkinson, and Marguerite Driessen. I am the current President. The main assignment of the Genesis Relief Society President is to give support to the sisters who are regular attendees of Genesis. There is no manual to follow to do the calling. Counsel is given by the Genesis President, to whom I directly report, and the entire presidency. Most of how to do my calling is given me by God. I visit sisters’ wards to support them where they attend church. I answer their phone calls and listen to their difficulties of being a black woman in the LDS Church and try to give counsel. I work with white women who are married to black men to help them understand certain things about being married to a black man. I work with white women who have adopted black children to help them through the difficulty of figuring out about care of hair and skin. I work with adoptive parents to help them with their teenage black children who are facing racial issues about the church and in the church community, and strive to assist them in navigating those stormy waters. I represent Genesis at funerals of prominent black persons in Utah or in the church as well as those associated with Genesis. I teach people about the essay Race and the Priesthood. I teach people truth about black people and debunk myths that have long been taught in the church and sadly are still taught and believed today. It would appear that with so many great advancements within the church in the last decade in including black women, perhaps the need for Genesis isn’t as great as it was during the priesthood restriction. As a discussion in a group I was moderating a few nights ago reminded me and taught the white LDS members in the group, racism still exists and still has a tight grip within the LDS Church. As members of the church we need to have the hard and uncomfortable conversation of racism. We need to keep having it to expel all the hot-air anger and have it until we’re able to reach effective dialogue during which we are truly hearing one another, learning, and changing our generations-old myth-based paradigm – however subconscious it may be. Have we as a church and as a country come a long way? It has been 151 years since slavery ended. It has been 38 years since the priesthood restriction was removed. I am often asked why I’ve stayed in the church and how I was able to. I always reply: I know the ordinances that this church offers are true and of God and that the priesthood power that administers them is a direct line from God. I stay for the ordinances and the blessings they are to my life. I have acquired a deep respect for historians as they have been the ones who have revealed the past, brought out of darkness into light truth long hid, and handed me new heroes. It was historians Darius Gray and Margaret Blair-Young who taught me about Jane. It was historians who were assigned to research and compile the official essay of Race and the Priesthood and fulfilled a promise given me more than 20 years ago that one day all the church would know that God did not curse black people. Thank you for your work. Please don’t stop. And I don’t believe He brought me this far to leave me. I KNOW that God didn’t bring us this far to leave us. About Alice Faulkner Burch: A native of Oxnard, California, Alice joined the LDS Church in 1984. She served as the first full-time proselyting African American missionary in Santiago, Chile, where she and her companion were assigned to serve as first and second counselors in a branch presidency. She has served a one-year mission in the Salt Lake Inner-City Mission and five years at the Utah State Men's Prison in the Family History Center. She has worked for the LDS Church for 27 years and enjoys writing articles about her life experiences and her personal scripture lessons. She also enjoys indexing the Freedmen's Bureau records. She has been married to Robert Samuel Burch, Jr., the great love of her life, for four years.